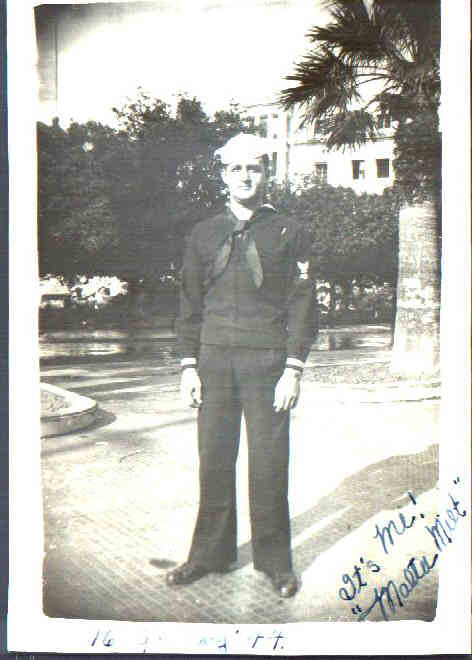 My grandfather was a sailor in the Second World War. This space is dedicated to him. What you are about to read is a legacy left to me by my grandfather, Milton Briggs. He died in his sleep on February 14, 1986 of congestive heart failure. We were very, very close, and this diary is very special to me. Milton Briggs, as I remember him, was a kind and gentle man. I think he wanted me to publish this because he wanted to remind the world that even though World War II was the last "good" war, it wasn't very kind nor gentle. Much of what follows was transcribed from fifty year old, handwritten documents, I have not corrected grammar or style (though, occasionally, I did correct spelling). Much of it was written as the bombs were dropping. Remember that. A good introduction to this is a letter that he wrote to a cousin. You ask for my war experiences; I have only talked of those frightening days to one person, who shall remain nameless, but I will write to you because you ask it from a generation that will soon pass. I was a voice student in the Moser Conservatory in New York for 2 years. One month before I enlisted, I auditioned for Jacob Schwartz of the St Louis Municipal Opera and was rejected. I was very disheartened and joined the Navy. One week before I left boot camp, the school called me and said Mr. Schwartz was coming to New York to hear me again and was going to give me a chance in the opera, but fate took me in another direction. Thus my singing career was ended forever. After Navy school, I shipped aboard the U.S.S. Brooklyn, a light battle cruiser. She was armed with 15 six inch guns, 8 five inch AA guns, 20 40mm guns of 4 per mount, and 40 twin 20mm cannon. She carried a crew of 1600 men. My battle station was radio man on the open pilot house bridge, from where I saw three years of open view combat. My job was to keep a log of battle, and because of my baritone voice, to sing out for the Captain, gunnery officer and navigator, all battle action that was relayed to me by planes, ships, and Army commands from the battle area. In all church services, Captain Denebrink ordered me to sing "The Lord's Prayer" for the crew. I was given a commendation by him as "the powerful voice that brought calm and clarity in the heat of battle." Such was my only acclaim to glory. Scott, after 40 years, the memories of war are today as vivid and frightening as the days and hours as when they happened. To the day I die, I will never understand why I shed tears over those events. Time should have erased such memories, but they still remain. War is so terrible.